Timothy J. Northcut serves as Music Director of the famed CCM Brass Choir and coordinator of the brass chamber music program. 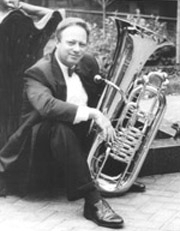 Under his leadership, the Brass Choir has performed at the 1995 International Brassfest (Bloomington, Indiana), the 53rd Annual MidWest Clinic: An International Band and Orchestra Conference (Chicago, Illinois) and the 2002 Ohio Music Education Association Professional Conference (Cincinnati, Ohio). In the spring of 2003, the Brass Choir performed and recorded with the Cincinnati Pops Orchestra for the Telarc Label. In 1997 and 2003, Northcut was awarded CCM's Ernest N. Glover Outstanding Teacher Award. In 2003, he was also awarded the University of Cincinnati Mrs. A. B. (Dolly) Cohen Award for Excellence in University Teaching and was recently recognized as one of Ohio's Top 100 Educators in Ohio Magazine's Excellence in Education Awards. From 1998-2001, he served as the Executive Director of the Rafael Mendez Brass Institute, an international performance and career development seminar for brass musicians in conjunction with Summit Brass, America's premiere large brass ensemble. Northcut currently performs as Principal Tuba with the Dayton (Ohio) Philharmonic Orchestra, the Cincinnati Ballet Orchestra and is a member of Symphonia, America's large professional tuba-euphonium ensemble. He also serves as an Artist-Educational Advisor for Custom Music Company (Detroit, Michigan) in addition to serving as an Executive Committee member and Journal Advisor for the International Tuba Euphonium Association. His past experience includes serving as a member of the military's premiere touring band-The United States Army Field Band (Washington, DC)-and numerous solo and chamber music appearances. He is currently completing a Doctor of Musical Arts degree from Arizona State University. Northcut is proud of the guidance and tutelage provided by his teachers James Garrett, R. Winston Morris, Harvey Phillips, David Fedderly, Warren Deck, and Daniel Perantoni. Tim recently released a compact disc recording of works for solo tuba with band accompaniment titled Tennessee Tech Pride. It is available from Mark Custom Recording Service in Clarence, New York. DMA, Arizona State University , Tempe, AZ. BS, Tennessee Technological University, Cookeville, TN. MM, The Catholic University of America, Washington, D.C..